Arachu kalaki is A typical traditional Iyer dish from kerala. As I belong to Tirunelveli in tamil nadu My village is near kerala border and follow some dishes from kerala. 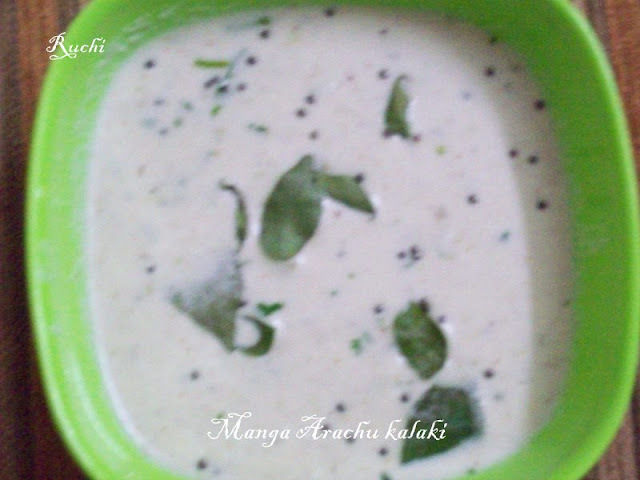 This dish is a curd based gravy prepared using kanni manga /Kadugu manga or Vadu manga or Maavadu-preserved in salt water ground with green chillies, and coconut and tempered with mustard seeds, red chillies and curry leaves.It goes well along with hot steamed rice, poricha kuzhumbu, Pulikeerai .Today I made arachukallaki along with poricha kuzhambu. It is really delicious and makes a excellent side dish. 1.Wash the mavadu and cut into pieces. 2.Grind coconut, mavadu, green chillies, in a mixer and mix well . 3.Pour the whisked curd on top and mix everything well. 4.Heat coconut oil in a small pan. Add the mustard seeds. Once they start to splutter add the whole red chillies(broken into pieces). 5.Switch off the flame and then add the curry leaves. * No need to add salt because the mangoes have already salted. If needed salt,add little..